On the way to Mackinac Island this past weekend we took the scenic route along the east coast of Michigan to catch a couple of lighthouses. 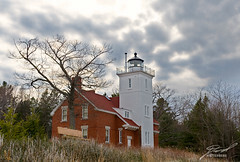 This is the Forty Mile Point Lighthouse which we caught as the rain was approaching and the sun began its decent. Through exposure blending of three branketed exposures I was able to capture this image from the cold, very windy beach. Sadly the lighthouse was closed for the season and the light was not on. Perhaps I'll have the chance to try again in August when they're planning a Geocaching event at the park.